Morning, mid-day and evening, plants need water to manufacture and transport the chemicals that build new roots, leaves, flowers, fruits and seeds. Although the need for water is constant, times of drought, conservation measures and high water rates dictate that homeowners should water their gardens in early morning or late afternoon, when more water penetrates the soil, hydrating plant roots and providing moisture reserves. The cost of water isn't the only reason to conserve the resource by irrigating plants early in the day. 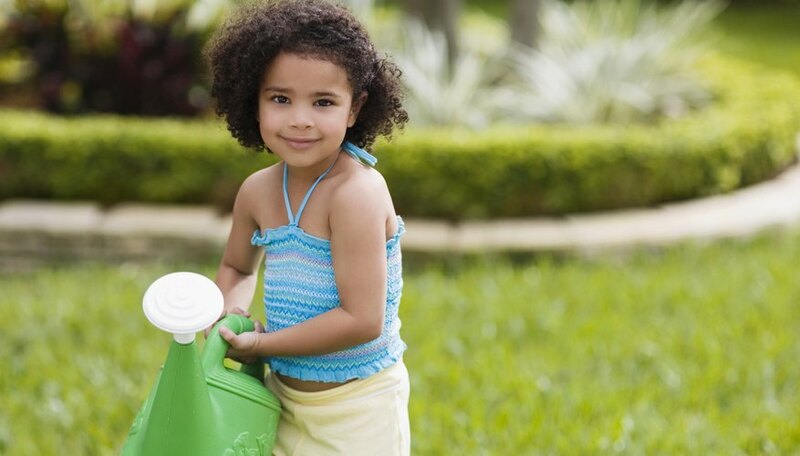 According to the [U.S. Environmental Protection Agency] (http://www.epa.gov/WaterSense/pubs/outdoor.html), a typical American household consumes 320 gallons of water per day, and about 30 percent of that water is used outdoors. In drought-stressed or dry-climate regions, the outdoor use can be up to 60 percent of the water consumed. Up to 50 percent of water used for irrigation can be wasted in evaporation from practices such as overhead sprinkling and shallow watering during the heat of the day. Determine how long to irrigate your outdoor plants by putting four or more tin cans in your garden, sinking the cans in the ground under drip-hose segments. Run irrigation water until an average of 1 inch of water collects in the cans. Divide that irrigation time into two or three watering sessions spaced throughout a week to distribute moisture evenly. The water drawn by plant roots from soil fuels chemical reactions as it travels upward in a process called respiration. Excess water vents through leaf cells in a process called transpiration. Transpiration sets up evaporative cooling around plants, protecting their surfaces on hot days. At night, cooler temperatures limit evaporation, leaving expelled moisture on leaf surfaces as dew. Dew protects surfaces by insulating them from cold temperatures, but prolonged wetness also can nourish diseases. Watering during morning hours when temperatures are cool limits evaporation, providing more water for plant roots. If you use a soaker or drip hose, then you practice even better water economy because the drips from the device soak into the soil faster than rainwater from a sudden shower. Morning irrigation that, together with rain, totals 1 inch or more per week provides water for daytime transpiration as well as a deep reserve in the soil to encourage deep root growth. Deep roots make plants more drought-resistant because they can still draw moisture when the upper inches of soil are dry. Strong sunlight, drought and periods of high wind speed transpiration and increase plants' need for water. Also give plants extra water when they are flowering and producing fruits. Place mulch on the soil surface to cool and conserve soil moisture. If fungal diseases are not a problem in your garden, then you can water your outdoor plants in late afternoon as well as early morning. Give the plants time to dry, however, before the sun goes down and the temperature drops. Container plants may require watering once each day or more often, depending on how fast the soil inside their pots heats. Soak soil that has dried and pulled away from a pot's sides until the water runs through the pot's bottom drain holes; do that two or three times, with 20 to 30 minutes separating those times, in the morning and again in the afternoon if necessary. The breaks between soakings allow the soil to absorb moisture fully. University of California-Santa Barbara ScienceLine: Why Do Plants Need Water?